FOUR local mysteries are among the cases being highlighted nationally as part of this year's Missing Persons Week. 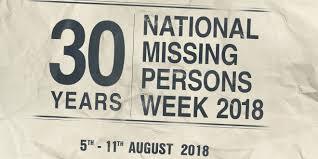 “This week as we commemorate 30 years since Missing Persons Week originated, we aim to raise awareness of missing people and seek information from the public that would help police to locate missing people,” Tasmania Police missing persons co-ordinator Andrew Lockley said. Dale Nicholson has not been seen since leaving his home in New Norfolk on December 11, 2016. Jason Mazurek has not been since he left the Wrest Point Casino on September 15, 2002. Eve Askew went missing from her home at Fitzgerald during the night of November 16, 1991. Lucille Butterworth disappeared after accepting a ride to New Norfolk on August 25, 1969. “The impact on families and friends left behind when someone goes missing is significant. Families always deserve answers to what happened to their loved ones and police will not close a missing person case until the answers are found,” Constable Lockley said. In Tasmania, around 125 people are reported missing each year and police say nearly 99% are located, most within 48 hours. In Tasmania there are 163 people listed as missing since 1955. “Over the coming days, I urge people to take a look around for Missing Persons Week profiles, particularly on social media, look at the faces of our missing people and keep the families of those missing in their thoughts," Constable Lockley said. Anyone with information that may help police to solve a missing persons case, even if it’s a small piece of information they think may be insignificant, is urged to contact Tasmania Police on 131 444 or Crime Stoppers anonymously on 1800 333 000.
answers for the loved ones left behind,” Constable Lockley said. To report a family member as missing in Tasmania, interstate or overseas, contact Tasmania Police on 131 444 or 000 in an emergency.